Summary from Goodreads: I, Felton Reinstein, am Stupid Fast. Seriously. The upper classmen used to call me Squirrel Nut, because I was little and jumpy. Then, during sophomore year, I got tall and huge and so fast the gym teachers in their tight shorts fell all over themselves. During summer, three things happened all at once. First, the pee-smelling jocks in my grade got me to work out for football, even though I had no intention of playing. Second, on my paper route the most beautiful girl I have ever seen moved in and played piano at 6 a.m. Third, my mom, who never drinks, had some wine, slept in her car, stopped weeding the garden, then took my TV and put it in her room and decided she wouldn’t get out of bed. 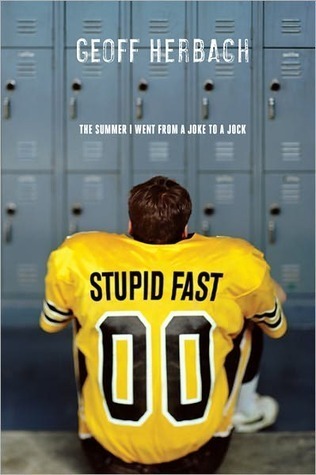 Review: Stupid Fast is a great read for guys. Looking back at the books I’ve recently reviewed has strong female protagonists This is a breathe of fresh air. Felton is a dork turned jock who is incredibly witty and down right funny. Even though Felton wants to be a comedian, he doesn’t think he’s funny enough. I would have to disagree with him. While there are much darker issues going on his life, Felton’s blunt honesty makes you smile, giggle and cry from laughing. Teen guys will be drawn to this book for the sports. However, if you’re looking for play by play descriptions, you won’t find it here. Felton is discovered by the football team because of his size and his speed. The coach and his teammates are counting on him to be a number one recruit; however, Felton has never played football before. While he’s trying to figure out the game, he’s also trying to figure out his mom’s sudden depression. Felton is forced to be the man of the house as his mom refuses to come out of her room. Felton’s little brother, Andrew, is willing to do anything to get his mom’s attention. While there is nothing funny about depression or children feeling neglected, I couldn’t help but laugh at Felton and Andrew’s banter as a result of their situation. I really enjoyed the character development and the story line of Stupid Fast. I look forward to reading more of Herbach’s book. Felton’s story conintues in Nothing Special and– coming in May– I’m With Stupid. Check out more on Geoff Herbach’s website.